Here's an old bottle someone found in the area when cleaning out the basement in an estate sale. California wineries often used the term "hock" on bottles of wine made from Riesling, stealing the name from the German Rhine town of Hochheim. If your screen is big enough, you may be able to see at the bottom of the label--this is made by Chateau Montelena in Calistoga! The Bercut-Vandervoort firm used to be a major player in the Bay Area wine business. They had a negociant brand of French wines called "Armand Roux" which I recall was considered by the locals as "tray sheek" and on par with other "notable" imported wines such as Mateus Ros, Mouton Cadet and Blue Nun. This ancient bottle was imported by the Bercut-Vandervoort company. Imagine if someone today tried selling a wine labeled "Vin Ordinaire!" Alois Finke was in the wine business around the last days of the 1890s and was, somehow, affiliated with the Groezinger winery in Yountville (Napa Valley). 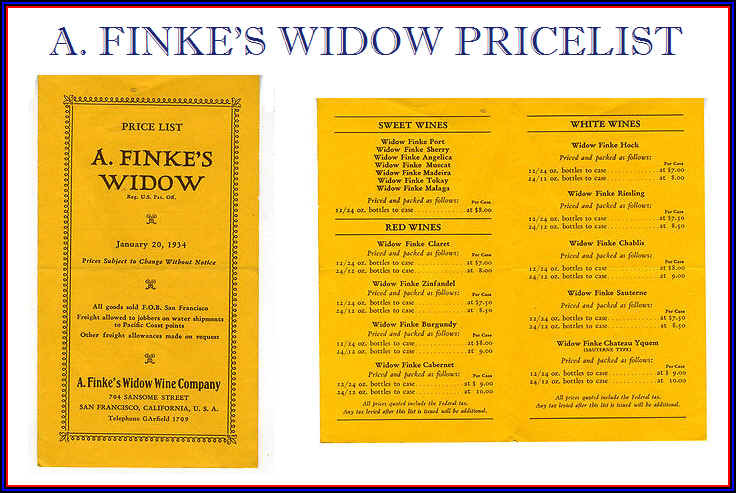 When he died, the label was called "A. Finke's Widow." He had been noted for his sparkling wines, which he turned into bubbly somewhere in San Francisco. 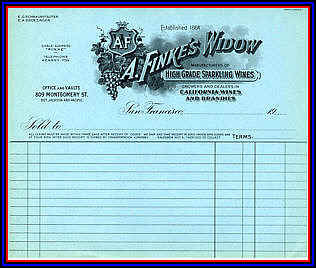 Rich Engle of Elk Grove, California, sent us an image of an invoice used by A. Finke's Widow. He said the building they were in appears in one of the Dirty Harry movies. Here's a price list from 1934...notice they made "Chateau d'Yquem"! California vintner's found it more profitable to use European wine names on their labels. French place names such as "Chablis" and "Burgundy" were commonly found on many American wines. This was made by the Pacific Coast Brands company. If it's called "Cal-Best," I'm sure it was mighty good. For those who think their brand is so strong, it will endure forever, here's the Italian Swiss Colony label. It was the most visited winery in California in its day, located near Cloverdale by Highway 101, thriving in the early 1900s! Founded by Andrea Sbarboro, this fellow invited Italian and Swiss to emigrate to Sonoma and they would make their living farming vineyards. Sbarboro took on a partner, Pietro Rossi, who was more skilled in winemaking. The venture prospered. 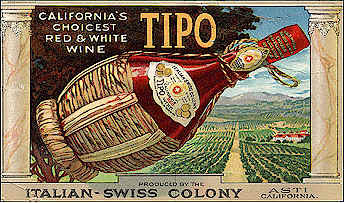 One of the most famous wines was Italian-Swiss Colony's "Tipo Chianti." It was said to be one of the best pre-Prohibition wines in California. The bottles were dressed in raffia to resemble the straw-covered fiaschi bottles so common in Italy's Tuscany. Greystone was the winery which now houses the Culinary Institute of America on Highway 29 in St. Helena. The building was built in 1889, the largest stone winery in the world! Built by William Bourn, it was intended to be a place for Napa vintners to make and age their wines. Unfortunately, the root louse Phylloxera struck at the time this place was built and it was sold to a number of concerns. The Roma Wine Company rented space to Christian Brothers in 1950. Christian Brothers made a huge range of wines. I noticed their labels in the late 1960s had an ingenious marketing concept: the color of the ink on the label corresponded to the intensity of the wine in the bottle. If you looked at the bottles lined up on a shelf, you could easily differentiate the lighter red wines from the fuller-bodied wines. Brother Timothy, who was the winemaker in the 1960s and 1970s, was an advocate of "non-vintaged" wines. He claimed you could make superior wine by blending a high acid vintage with a riper, warmer year, for example. The wines never were fabulous (by my young and budding palate). I always found them a bit watery and uninteresting. A curious bit of the wine law of the day was that varietal wines in those days needed to be but 51% varietal! For the Napa appellation, the requirements were apparently less stringent for non-vintaged wines than for vintage-dated bottlings. A non-vintaged wine, if I understood this correctly, didn't have to have as much "Napa" juice in it as one carrying a vintage date. The winery used to host a lavish luncheon and wine tasting for those who managed to write an article about wine which found its way into the printed pages of local newspapers. You could always tell when this event took place, as the eno-scribes would dutifully attend the luncheon and each would write an article praising the "new dedication to quality" being undertaken by the Christian Brothers. I'd taste the wines and wonder what they were tasting that I wasn't...Of course, it may have been the samples were rigged to sandbag these "journalists" or, perhaps, the opportunity to have a fancy meal without having to pay for it colored the palates of these not-so-impartial critics.